Simple Truths is a free family game which you can play with your family members and friends on your Windows 8 and 8.1 computer. The game is really simple and does not require any kind of physical inputs. The game is another spin-off just like What if… But the motive of this game is entirely different from the other games. The game is not at all difficult for any user and anyone can play it. It is fun to see which one of your answer can be correct. This game app is based on a simple rule where you have to choose the correct answer to achieve points and clear the level to move on to another level. At every question you are given two statements, from those two statements you have to choose one that you feel is correct. If it is correct then the background of the game changes to green. 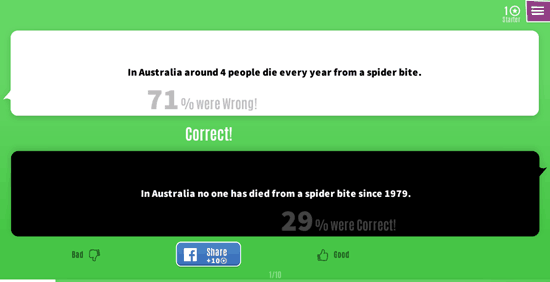 After choosing the answer, it also shows you the statistics of how many people chose which answer and how many were wrong or right. You can rate each question, if you like it then you can click on Good otherwise you can click on Bad. Whenever you answer the question, you will also see a small button that has Facebook sharing option on it. If you will share it then you will be rewarded points for it. In the game you can earn free coins by sharing the game statistics, liking the game page on Facebook, connecting your Facebook profile to the game app, inviting your friends to the game and by other similar means too. Other similar quiz apps you can try out the flag quiz and guess the song music quiz. The game has beautiful and subtle color scheme to it. The graphics are simple yet attractive to the eye of the player. You can access options in the game by clicking on the button on the top right side of the screen of the game.